A New NASA Conspiracy: Does This Photo Show a Man Fixing the Mars Rover? Look at the above image. 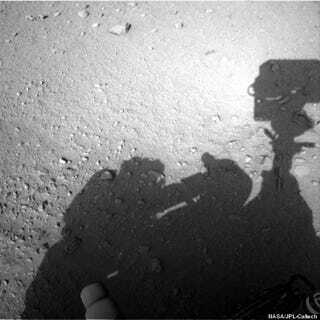 Doesn't that shadow look like a man in a spacesuit of some sort working on the Curiosity rover? Which is supposed to be on Mars, and not where humans can mess with it? Someone who wants to remain nameless has found a shadow of a human-like being messing with the Mars Curiosity rover. The person has no helmet and their short hair is visible and in high detail. The person has on air tanks on their back and a suit that covers most of the body except the hair. This leaves us with three confusing thoughts. 1st Is this proof that the rover is on Earth and not Mars and humans are cleaning it off and performing maintenance? 2nd Is this proof that humans are living on Mars in abandoned alien bases? (i.e. Gary Mckinnon hacker said he found such evidence on US govt computers). 3rd Is this proof that alien are messing with the rovers? Dude has not moved at all.